First, IPv6 address consist of 4006:a0bd:c0a8:b229:40e9:a79c:f129:50. This could be some part of an IPv4 address, c0a8:b229 corresponds to 192.168.178.41 and 40e9:a79c corresponds to 64.233.167.156. Why? I don't know. Could you share more information? The first red flag for me was the fact the IPv6 address started with 4006. 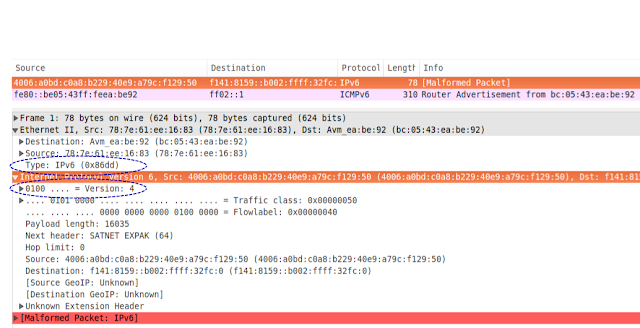 Is there any reason why valid IPv6 packets would be outside the 2000::/3 or fe80::/10 ranges?